The program was originally introduced in “preview” last fall, with the goal of collecting user feedback ahead of its public launch. Since then, more than 1,000 businesses have signed up for the service, including a large winery in California and a hospitality company that uses it to staff their hotels. Explains Office 365 General Manager Bryan Goode, Microsoft believes that addressing the needs of shift workers with a software platform like StaffHub is an untapped market. However, what StaffHub is really up against is the old way of doing things: paper schedules, bulletin boards, phone calls and other manual processes, Goode notes. To address the needs of this different kind of work environment, StaffHub takes schedules and puts them online. But it’s more than just another calendaring application. Managers, who may have access to desktop or laptop computers, may use the web version of StaffHub to create the staff schedules in the program, but employees will likely only use StaffHub from their mobile phones. When adding shifts, managers can take advantage of a variety of features to differentiate the types of shifts, ranging from custom labels (like “day,” “opening,” “night,” etc.) to color coding, and they can also enter in notes about the work that needs to be done during the shift in question. Where StaffHub becomes more interesting is on mobile devices. Here, there are comparisons that can be made with Slack, though Microsoft, when asked, dismissed the idea that Slack was a competitor. However, there are many overlapping features between the two programs — staff can privately chat, one on one, with one another in the app, and the app can host multiple group chats, too. For example, managers could use their team chat to make informal announcements or share files. The chats support photo sharing, as well, which could be useful for showing the manager something out on the floor that needs their input. Plus, the app can be used for sharing internal resources — like an employee handbook hosted on SharePoint, a file uploaded from a computer, a video or a file stored on another cloud service like Dropbox. Files will display inline when clicked, making it easy for staff to view them on their phone. 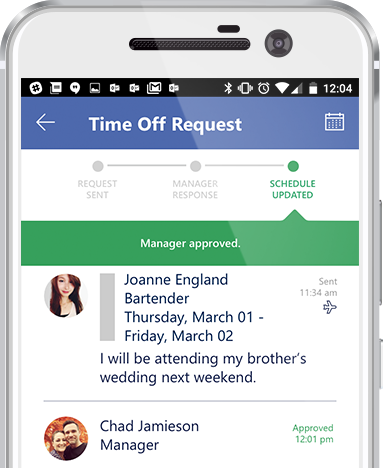 Staff can swap shifts with other workers in the mobile app and request time off — requests that get routed to a manager for approval. Push notifications are used to alert users of these requests and approvals along with other updates, private notes, chats and more. StaffHub is available for web, iOS and Android in Chinese (Simplified), English, Spanish, Russian, Japanese, French, Brazilian-Portuguese, German, Korean, Italian, Chinese (Traditional), Dutch, Turkish, Swedish and Danish.